The INDI pendant features an oil rubbed bronze finish with glass shades. The unique industrial design adds exceptional appeal to this fixture and is perfect for the dining room, kitchen island, restaurants, and many other applications. 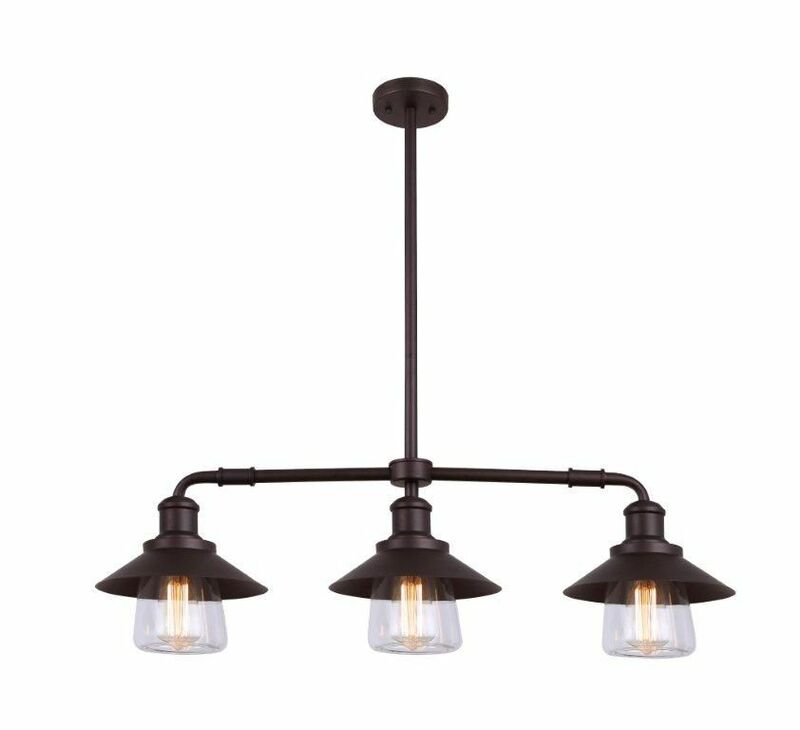 The Edgemoor 3-light pendant offers transitional style with added flair. The oil rubbed bronze metal framework upgrades a white linen fabric shade with a chic criss-cross design and excposed arms and offers diversity to any room setting. This collection offers scalloped glass accentuated with finely crafted stepped details on the metalwork. Choose between mercury glass with metal finished in oiled bronze or clear glass with metal finished in polished chrome. A unique design for fit any decor. The Linden collection features a drum shape made from a textural wall of metal or crystal. A frosted glass diffuser (metal tube items) or textured clear glass (crystal items) is cleverly recessed into the drum for a smooth, seamless appearance. Various finishes, including Polished Nickel, Brushed Nickel, Aged Brass and Oil Rubbed Bronze are adaptable into any colour scheme. Industrial inventions of yesteryear are reclaimed and reinterpreted to deliver the style demands of today. This classis filament style bulb can either be showcased within a clear blown glass shade or proudly shown alone. A cloth cord and Oiled Bronze finish add authentic charm and versatility. INDI 3 Light Clear Glass ORB Pendant in Oil-Rubbed Bronze The INDI pendant features an oil rubbed bronze finish with glass shades. The unique industrial design adds exceptional appeal to this fixture and is perfect for the dining room, kitchen island, restaurants, and many other applications. INDI 3 Light Clear Glass ORB Pendant in Oil-Rubbed Bronze is rated 4.4 out of 5 by 44. Rated 5 out of 5 by Sherrill from Excellent quality. Easy to install. Retro style adds a designer... Excellent quality. Easy to install. Retro style adds a designer look. Looks vLooks great with regular light bulbs also. Rated 5 out of 5 by Bill from All went well from my ordering to install. I would... All went well from my ordering to install. I would do it again. Rated 4 out of 5 by Lindsey from The light fixture is beautiful! My only complaint is the... The light fixture is beautiful! My only complaint is the glass globes are extremely fragile and thin. One of them had a small chip in it, but it wasn't noticeable, so I didn't worry much about it. Rated 5 out of 5 by Janet from I am very happy with this purchase. It looks... I am very happy with this purchase. It looks wonderful over my kitchen island. I will upload a photo later. Hello, please contact our customer service reps at 1-800-265-1833 and they will be glad to assist you, thanks! Can this light be mounted to a vaulted ceiling? Hello, this fixture cannot be mounted on a vaulted ceiling, thanks!